Album art by Fivethousand Fingers. 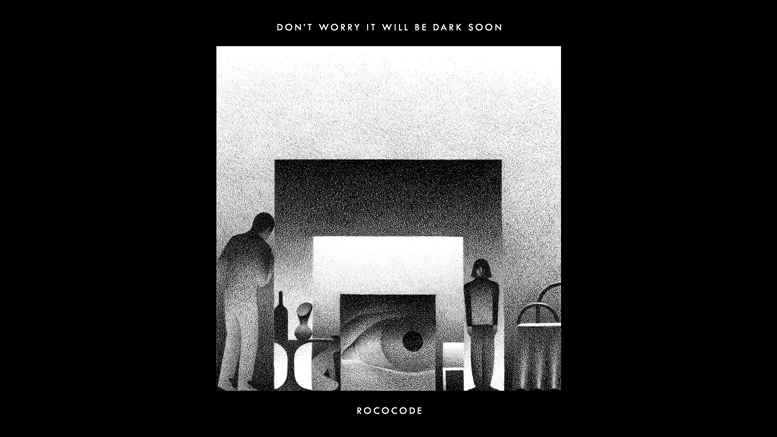 Musically, Rococode are exactly what you’d anticipate from their indie-pop moniker. Genre staples like propulsive drumbeats, an instrumentation mostly dependent on synths and keyboards, and intertwining, harmonized male/female vocals are all present in spades on the group’s second full-length release, Don’t Worry It Will Be Dark Soon. The album is slickly produced, and ready-made for alternative radio. Duelling vocalists/multi-instrumentalists Andrew Braun and Laura Smith have talent and proficiency to spare; the number of perfect pop songs the two have crafted on this album are evidence enough of that. Unfortunately, it’s also the main reason why Don’t Worry It Will Be Dark Soon just can’t quite stand out from the crowd – most of these pop songs are just that, and not much else. Take “Panic Attack,” for instance – it’s rhythmic, driving, and catchy to be sure, but it’s also about as formulaic as it gets, with a chorus that doesn’t have the urgency to warrant that much repetition. “A Diamond” and “Until You’re Mine” are plagued by similar problems, sounding a tad lifeless. However, this album wouldn’t have gotten the rating it did if every single track was like this. Don’t Worry It Will Be Dark Soon’s strong numbers are exceptionally so, and they often come about from the group choosing to add a little variety. “Baddest Sun” is a dark, twangy, and mid-paced number that lyrically reads like a melancholic country song, but retains the group’s constantly driving, danceable backbeat. “Dead and Gone,” on the other hand, seamlessly blends dream-pop guitar arpeggios with spacey vocals reminiscent of Porcupine Tree. Contrasted with the rest of the album, these standout tracks are a great example of how a song can be memorable without necessarily being catchy. On the other hand, songs like the aforementioned “Panic Attack” and several others are plenty catchy, but don’t leave a lasting impression. If you’re a fan of literally everything and anything labeled indie-pop then sure, give Don’t Worry It Will Be Dark Soon a listen. But a lack of experimentation and dull (albeit clear and pristine) production quality, means this album will not be one that ages well.